It's hard being a ten-year-old girl when everyone wants to turn you into a princess. Welcome to the lives of Bella, Grace, Chloe and Emily . . . 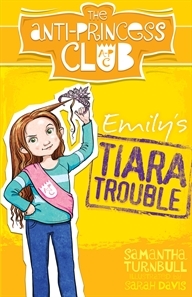 Without a distressed damsel in sight, The Anti-Princess Club books were inspired by the author's foray into the book section of a well-known department store where she could not find anything for her daughter that didn't feature a princess or a fairy. This refreshing middle-grade series will appeal to both girls and boys who are hungry for realistic fiction about smart characters solving their own problems.